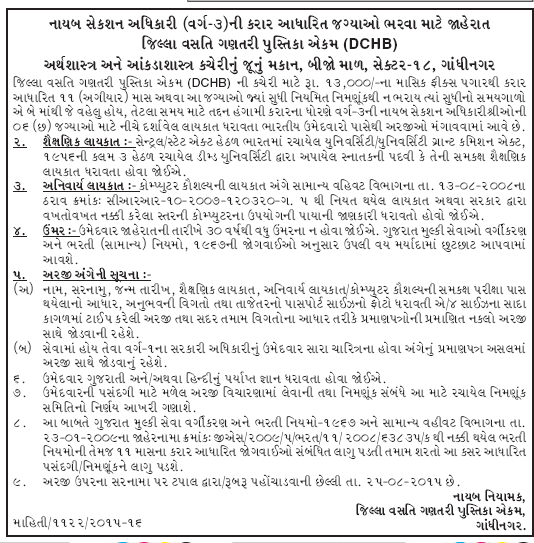 District Census Handbook (DCHB) Unit, Gandhinagar invited application for filling up Gandhinagar Deputy Section Officer Recruitment in DCHB department. Eligible candidates may send their application along with attested copy of document at below address on or before last date. 0.1 DCJB, Old House of Economics & Statistic Office, 2nd Floor, Sector -18, Gandhinagar. DCJB, Old House of Economics & Statistic Office, 2nd Floor, Sector -18, Gandhinagar.